Here's the scoop on how to make homemade peanut butter ice cream from scratch, without an ice cream churn. 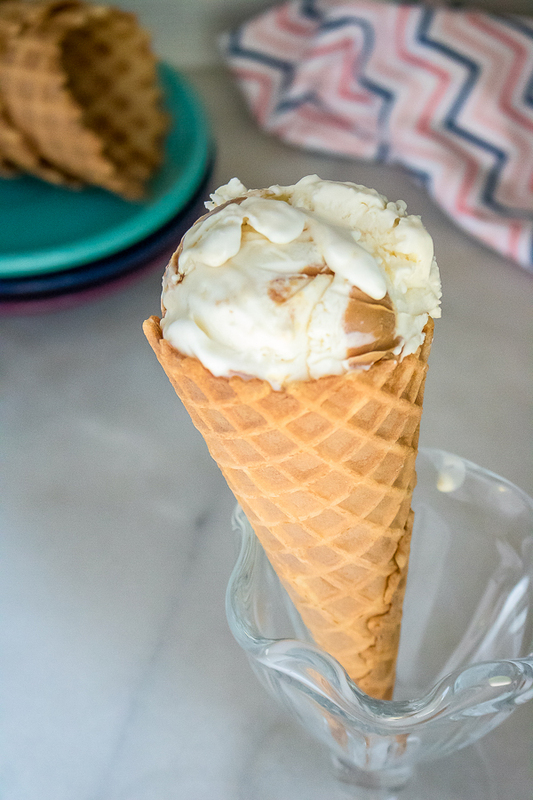 This yummy no-churn ice cream will have your family screaming for more! In a large bowl, combine vanilla, sweetened condensed milk and ¼ cup peanut butter and stir until combined. With a mixer, beat heavy whipping cream in a separate bowl until stiff peaks can be formed. Pour the whipped cream into the peanut butter mixture and fold in until smooth. Pour half the ice cream into a freezer safe container. Swirl in half of the remaining peanut butter with a spoon or a knife. Repeat with another layer and the remaining peanut butter. Freeze for 5-6 hours or overnight. When it is time to serve, remove from freezer and let sit on the counter to soften for 2-3 minutes before serving.